Greek and Roman art beautifully illustrated events and ceremony, but Celtic art was heavily into symbolism, the depiction of pagan thought and art that could only have come from the soul and their imagination. Celtic designs are complex, with a timeless feel to it. Their art is instantly attractive to any person of any age and period. Their designs and skills as artists and craftsmen are easy to appreciate and are ahead of their time. Many people feel spiritually moved just by looking at a simple Celtic knot. The spiral swirls on the bronze mirror from the Iron Age (right) also trigger the imagination and engage, focus and relax the mind. Celtic designs became softer, more flowy and serpentine by 100 BCE. They combined this new meandering style with the geometric styles from earlier traditions. The Celts interspersed foliage patterns, spirals, tendrils with crescents, trumpets and other famous Meditteranean motifs of the century. They drew and carved human faces and heads into these complex, braid-like designs. There were also many depictions of bulls, boars and ducks as motifs. After Christianity, these unique methods of art were preserved in metalwork, stone crosses and illuminated manuscripts. A bestiary is a book of animals, real or otherwise, used by rulers and teachers for conveying moral and symbolic tales to the common people. The Celts were occupied with creating bestiaries that were distinctively theirs. They fashioned animals whose bodies, arms, legs and tails were woven into colorful, intricate and overlapping knotted patterns. The Celtic people were described as painted and artistically scarred, or tattooed. They most likely used tattooing to indicate their tribal connections and to depict their social standing and occupation. Caesar made a lot of notes about the Celts. In 55 BCE, he observed the Celts processing woad (Isatis tinctoria) with which to paint their face and body. Strabo also wrote that the tribal Celts painted their faces and bodies. Herodian, a Roman historian, described the Celts as having punctured their bodies with symbolic animals in 90 CE. Coincidentally, the word "Briton" means "painted in various colors." 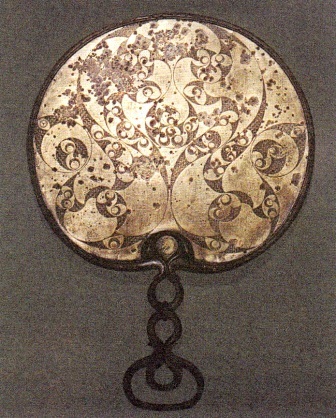 Celtic art has, indeed, made a striking impression on the conquerors early on. The Romans described the Britons as following a tradition of painting their bodies, faces and hands. So far we can see the connection between the Picts, the Britons and the Celts: they were all body artists. Again we look into the memoirs of Herodotus who related that the Getae, which some scholars believed were the Celts, signified their noble social standing or mark of good birth through tattooing. He claimed that an untattooed Celt was of inferior birth. However, other authors told of tattoos that marked Celts of common birth, including the undesirables in a Celtic society. To make their tattoo paint, the Celts soaked the woad leaves in water to obtain a red-brown mixture. This liquid was drained off and mixed vigorously with urine (ammonia) until it settled. This might have been done repeatedly to produce the color indigo. This indigo was insoluble in water, ether, alcohol and diluted acids and possessed antibacterial properties. The Celts then smeared themselves with woad and fat before any battle. instantly intimidated their opponents with their enigmatic scars, tattoos and painted faces. Wouldn't you think twice about picking a fight with a blue-faced, heavily scarred toughie who looked oblivious to pain? I know I would. Celtic art, whether in tattoos, jewelry design or architecture, prevailed for centuries and up to the present. The Celts practiced tattooing even after their conversion to Christianity. It was during this time that Celtic art flourished further, with the Celts perfecting their dazzling zoomorphic designs. They adorned illuminated manuscripts such as the Book of Kells, the Book of Lindisfarne, and the Book of Kildare with a number of stylized birds, bears, dears, wolves and other animals. I hope you enjoyed reading this article as much as I enjoyed writing it:-) Want to read more about the Celts? Please click the links below. There is also this fascinating article on how the Celtic knot inspired a scientific discovery that can be applied in the treatment of a multitude of diseases. Return from Celtic Art to main Celtic Symbols page? Or read more about Celtic spirituality and the Druids here and about its amazing people here. Go back to Symbolisms homepage for more symbols and symbolisms content.